‘Public bodies have historically given more thought to issues of race and disability than to sexual orientation’. [i] I haven’t spent much time checking through the records of public bodies before, but this fact was made very evident to me as I flicked through our catalogues relating to the LSPU (or London Strategic Policy Unit). There are reams of documents relating to race, but LGBT-related material is like gold-dust. 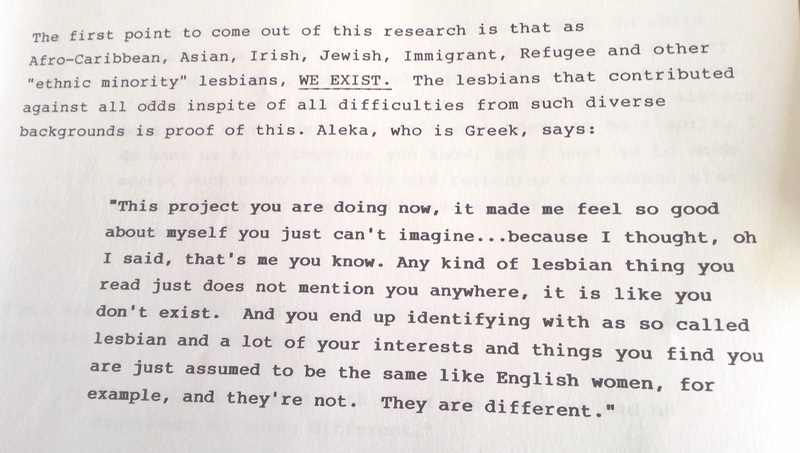 Imagine my excitement then, when I stumbled across a file enticingly labelled, ‘Lesbians’ which, as it turns out, includes a report about immigrant, refugee, Afro-Caribbean, Asian, Irish, Jewish and other ‘ethnic minority’ lesbians. At the time it was written (1986), the author asserts her belief that there were only two articles about and by non- white lesbians in Britain. The report highlights the way in which lesbians from non-British nationalities have had their rights and, sometimes, even their existence denied in this country. Many have been brutally attacked for their race and sexuality. There is even one extract detailing how an Arab lesbian was beaten so badly by a group of white lesbians that her spine and her hearing in one ear were permanently damaged. [i] Guasp, April. ‘Serving black and minority ethnic gay people properly’, The Guardian. <http://www.theguardian.com/public-leaders-network/2012/aug/24/serving-black-minority-ethnic-gay-people> [Accessed 2/9/15].